The relationship between small-volume alkaline potassic melts such as kimberlites and large-volume flood basalts represented in Large Igneous Provinces (LIPs) generated by mantle plumes is a matter of petrological as well as geodynamic interest (see Mitchell, 1995; Schisel and Smail, 2001; Lehmann and Chalapathi Rao, 2011; Zhang et al 2013; Ernst and Jowitt, 2013). Such an association between kimberlites, flood basalts and mantle plumes has been well documented in various LIPs such as (i) the Siberian Traps, (ii) the Karroo- Ferrar, (iii) the Parana-Etendeka, (iv) the Keewinawan, (v) the Deccan etc. and is considered to be a cause-and effect relationship via mantle plumes thereby denoting a petrogenetic connection (e.g. Chalapathi Rao and Lehmann, 2011; Ernst and Jowitt, 2013). Widespread basalts, mafic dykes and felsic volcanic rocks occur in Madagascar with eruption ages of 90.1 ± 1.2 Ma to 84.5 ± 0.7 Ma and are considered to be a part of the Madagascar LIP of Bryan and Ernst, 2008) and related to the Marion hotspot and the breakup of Madagascar and the Seychelles from Greater India at ~88 Ma (Storey et al., 1995, 1997; Torsvik et al., 1998; Cucciniello et al., 2013; Reeves, 2014; Buiter and Torsvik, 2014). Scattered dolerite dykes from the (i) northern and southern coast of Kerala (86.5 ± 0.8 Ma to 85 Ma; Radhakrishna et al., 1994), (ii) Agali-Anaikatti area in the southern granulite terrain (80 to 90 Ma; Radhakrishna et al., 1999), and (iii) Huliyadurga area Karnataka, eastern Dharwar craton (90 ± 1 Ma and 87.5± 0.9 Ma; Anil Kumar et al., 2001), as well as felsic lavas from St. Mary’s island, off Mumbai (85.6 ± 0.9 Ma; Pande et al., 2001), are generally regarded to be the isolated magmatic expressions of the Marion hotspot within the Indian continental plate. In this review article, extracted from Chalapathi Rao et al. (2016), Dongre et al. (2017) and Ernst and Jowitt, 2013). we highlight the role of the Marion hotspot in the generation of diamondiferous kimberlites of 90 Ma age. We first briefly consider the link with the South African kimberlites (which has been previously presented in Ernst and Jowitt, 2013), and then the bulk of this contribution is focused on new evidence for c. 90 Ma kimberlites in southern India. 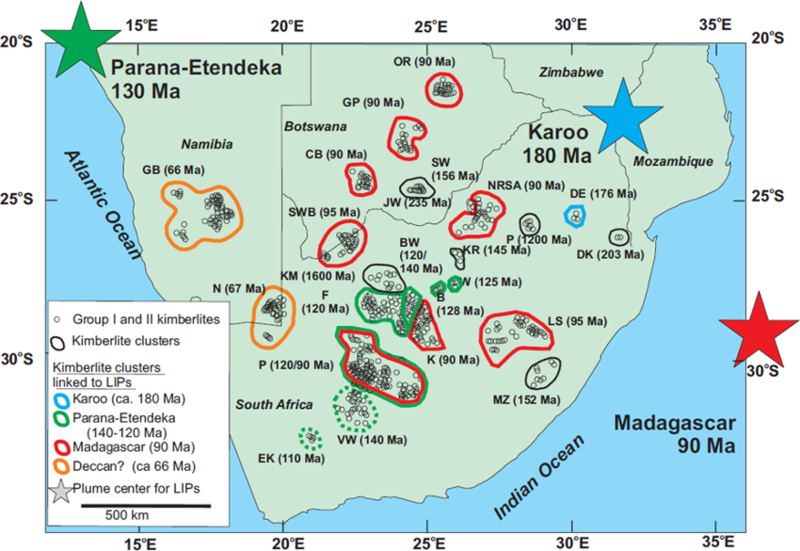 There are kimberlite clusters in southern Africa with a range of ages (e.g. Schissel and Smail, 2001). As noted by Ernst and Jowitt (2013) some of these can be linked, on the basis of age and proximity with known plume-related LIPs of the region, the 183 Ma Karoo–Ferrar, and 134 Ma Parana-Etendeka, and c. 90 Ma Madagascar LIPs. Madagascar was close to southeast Africa at c. 90 Ma (Storey, 1995; Torsvik et al., 2000) inviting suggestion of a connection between this 90 Ma LIP and southern African kimberlites. The 90 Ma kimberlite fields range from 700-1200 km away from the Madagascar plume center (star) at this time using the reconstruction of Torsvik et al. 2000 (Fig. 1). However, it should be noted that the reconstruction in Figure 5D of Reeves (2014) would place the Madagascar plume about twice as far from the coast at this time, increasing the distance to 1400-1900 Ma km. This increased distance is large for a plume head radius (typically about 1200 km; Campbell and Griffiths, 1990) and may complicate the linkage of the South African 90 Ma kimberlites with the Madagascar plume centre. The Eastern Dharwar craton (EDC) in southern India is host to >100 kimberlite intrusions which are distributed in three distinct fields (Fig. 2): (1) the southern Wajrakarur kimberlite field (WKF); (2) the northern Narayanpet kimberlite field (NKF); and (3) the central Raichur kimberlite field (RKF). The WKF is the largest of these fields, and comprises five diamondiferous kimberlite clusters: Wajrakarur, Lattavaram, Chigicherla, Kalyandurg and Timmasamudram (Fig. 2). 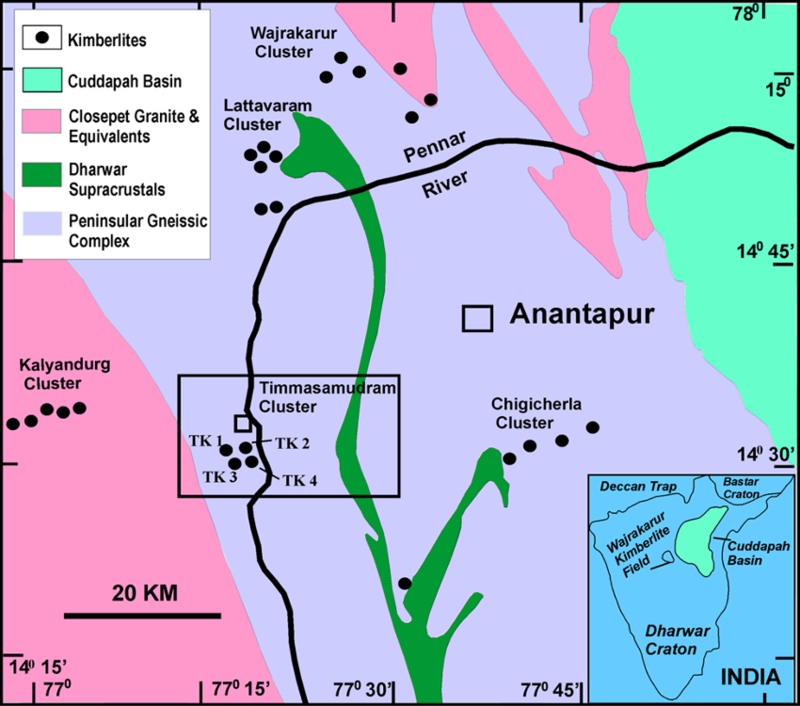 The Timmasamudram cluster (TKC) consists of four kimberlite pipes (TK-1, TK-2, TK-3 and TK-4) located in a small area of 2 km2 near Timmasamudram village (14o31’45”N; 77o18’30”E; Fig. 2; Srinivas Choudary et al., 2007). All bodies are semi-circular to oval in shape with dimensions of a few tens of meters and are emplaced in the TTG (Tonalite-Trondjhemite-Granodiorite) suite of the Peninsular Gneissic Complex. There are no outcrops of these kimberlites and they are capped by ~ 1m thick soil cover. Processing of kimberlite samples by the Geological Survey of India revealed TK-1, TK-2 and TK-3 to be non-diamondiferous whereas a very high incidence of diamonds of gem quality, the highest recorded so far from any of the kimberlites from India, has been reported from TK-4 (Srinivas Choudary et al. 2007; Sridhar and Sinha, 2008). TK-4 also shows two distinct kimberlite pulses - a coarse grained and a very fine grained variant (Sridhar and Sinha, 2008). Sampling of all four TKC kimberlites was done from pits/trenches excavated by the Geological Survey of India. Samples collected show varying degrees of pervasive alteration. Two distinct kimberlite pulses in TK-1 pipe – a microcrystic and macrocrystic variety (Fig. 3)- are identified (Chalapathi Rao et al. 2016). The microcrystic variety is finer grained with darker matrix and resembles a tuffisitic facies of a kimberlite sampled from the diatreme zone (see Hetman, 2008). The macrocrystic variety is coarser grained with relatively lighter matrix and possess the inequigranular texture implying its sampling from the hypabyssal or root zone (Mitchell, 2008). 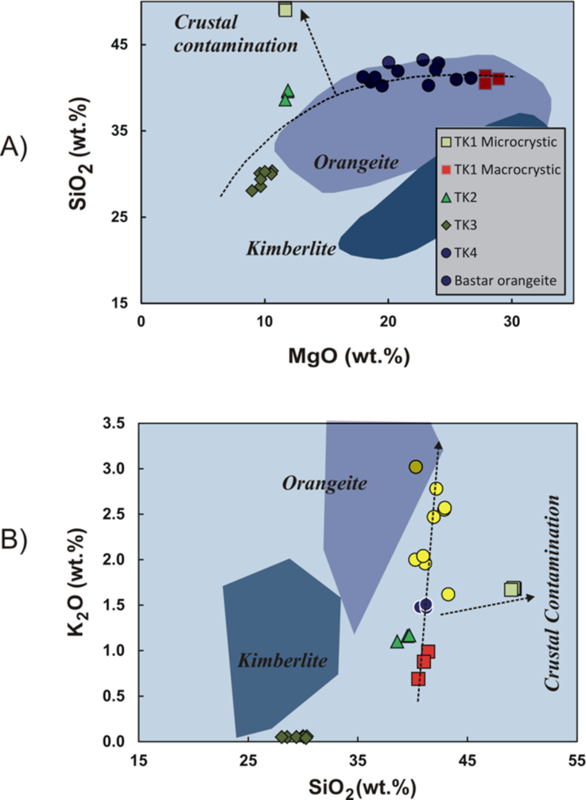 Petrographic study reveals that, with the exception of microcrystic pulse in TK-1, rest other TKC kimberlites are characterized by an inequigranular texture dominated by large sub-rounded to rounded olivine macrocrysts and subhedral to euhedral olivine microphenocrysts (Fig. 4). Serpentinisation and carbonitization of both types of olivine is common. Phlogopite, spinel, perovskite and carbonate are the other ubiquitous matrix phases present in variable proportions. High modal contents of phlogopite are noticed in TK-4 and some of which are also chloritized. Chocolate brown colored euhedral to subhedral perovskite (~30- 100 μm) is an important sub-liquidus phase (Mitchell, 1995) and occurs either as discrete grains, or as “necklaces” around earlier formed olivines Spinels dispaying ‘atoll’ structure are also noticed. TK-1 and TK-3 perovskites gave Mesoproterozoic ages of 1086 ± 19 Ma (Fig. 5A) and 1119 ± 12 Ma (Fig. 5C), respectively. However, a population of perovskite from TK-1 also gave a significantly younger, Late Cretaceous, age of 86.8 ± 3.4 Ma (Fig. 5B). No age could be obtained for the TK-4 perovskites (Fig. 5D) as they show effects of alteration (Chalapathi Rao et al 2016). The Nd isotopic composition was measured on the same perovskite grains on which U-Pb ages were obtained. The εNd(t1120 Ma) values of +2.1 to +6.7 of the TK-3, TK-4 and part of the TK-1 perovskites are similar (Fig. 6) and show a depleted signature characteristic of Group I (archetypal) kimberlites from the Eastern Dharwar craton and from southern Africa (Wu et al., 2013; Chalapathi Rao et al., 2013). However, the εNd(t90 Ma) value of -6.5 ± 1.2 (n=5) of the younger population of perovskite sampled from TK-1 is quite distinct in comparison and displays an enriched signature characteristic of Cretaceous Group II kimberlites from the Mainpur field, Bastar craton, central India (Lehmann et al., 2010) and Kaapvaal craton, southern Africa (Coe et al., 2008). Two populations of spinel, which show little variation in terms of morphology, can be distinguished in TK-1, based on MgO and Cr2O3 contents: (i) chrome-spinels having higher MgO (upto 12.2 wt. %) and high Cr2O3 (6.6- 49.2 wt.%, Cr/Cr+Al: 0.70-0.96) occurring in the TK-1 macrocrystic variety of kimberlite and (ii) low Cr-spinels having lower MgO (up to 8.9 wt.%) and highly variable Cr2O3 (up to 0.07-48 wt.%, Cr/Cr+Al: 0.08-0.96) in the TK-1 microcrystic variety. These populations likely reflect compositional differences between the two different kimberlite pulses in TK-1. The phlogopites in TK-1 (macrocrystic) are depleted in Al2O3 (<10.2 wt.%) as well as in TiO2 (<2.4 wt.%), and plot predominantly in the field of groundmass phlogopites in orangeites (Fig. 7). Phlogopites in TK-4 are relatively enriched in TiO2 (1.6 – 4.6 wt.%) and Al2O3 (11.6 – 15.3 wt.%) and follow the compositional trend of ultramafic lamprophyres (aillikites; Tappe et al., 2004), perhaps suggesting an affinity with such rocks for TK-4. Phlogopites in TK-1 (macrocrystic variety) follow the tetraferriphlogopite trend of increasing Fe accompanied by Al depletion, which is typical of orangeites (Mitchell, 1995). Cr2O3 contents vary widely with relatively higher contents in TK-4 (up to 1.2 wt.%), and lower contents (mostly < 0.07 wt%) in TK-1. Perovskite is more abundant, and comparatively smaller in size (~10 µm), in the microcrystic variant of TK-1, as opposed to the macrocrystic variant. Perovskites show wide compositional variation in terms of their TiO2 contents (TK-1 microcrystic variant: 51.1-57 wt.%, macrocrystic variant: 49.4-58.7 wt.%, TK-3: 53.2-56 wt.%, TK-4: 46.2-62.4 wt.%) and REE2O3 (TK-1 microcrystic variant: 1.8-3.3 wt.%, TK-1 macrocrystic variant: 2-4.4 wt.%, TK-3: 4.1-6.4 wt.%, TK-4: 4.4-7.2 wt.%). Perovskites in TK-1 (macrocrystic), TK-3 and TK-4, with their higher TiO2 and REE2O3 contents, display a marked compositional affinity with perovskites in orangeites (Donnally et al., 2011; Fig. 8). Macrocrystal and phenocrystal olivine are ubiquitous in the rocks of the TKC. Olivines in TK-1 are fresh, while those in TK-3 and TK-4 are mostly pseudomorphed by serpentine. The olivines in TK-1 (macrocrystic) are on average, more magnesian (Fo: 87.9-92.8) than in TK-1 (microcrystic), while those in TK-1 (microcrystic) are compositionally more diverse (Fo: 84.9-93.8) (Fig. 8). This may be a reflection of source characteristics, e.g. olivines in orangeites tend to be slightly more magnesian than olivines in Group 1 kimberlites (Mitchell, 1995). Ni contents in both variants of the TK-1 pipe range from 0.29 to 0.42 wt.%. Clinopyroxene is present as small, unzoned, prismatic crystals in the groundmass of only the TK-1 pipe. The clinopyroxene in the present study is a diopside of restricted compositional range, with little compositional difference between the macrocrystic and microcrystic variants (with the exception of Al2O3 and TiO2). In the TK-1 microcrystic variant, Al2O3 varies up to 1.76 wt.% and TiO2 up to 1.09 wt.%, while in the macrocrystic variant Al2O3 varies up to 0.88 wt.% and TiO2 up to 3.27 wt.%. The Fe-Mg-Ca compositions of clinopyroxenes at TK-1 (Fig. 8) are comparable with Fe-poor diopsides occurring in orangeites from southern Africa (Mitchell, 1995) and central India (Chalapathi Rao et al., 2011), and are markedly different in composition to that of clinopyroxenes from EDC kimberlites which have much higher FeO contents (Fig. 8). The rocks are characterised by a wide variation in SiO2 (28- 49.3 wt. %), withTK-1 (microcrystic and macrocrystic varieties) and TK-4 (macrocrystic variety) showing the higher SiO2 values (40.5-49.3 wt.%). These elevated SiO2 contents are similar to that of (i.e. are characteristic of) orangeites from the Bastar craton (Chalapathi Rao et al., 2011) as well as the Kaapvaal craton (Becker and Le Roex, 2006). Marked geochemical differences are also observed for the microcrystic and macrocrystic variants of TK-1. The microcrystic variant contains lower MgO (~11 wt.%), higher CaO (~13 wt.%) and K2O (~1.6 wt.%) whereas the macrocrystic variant is highly enriched in MgO (27-28 wt.%) and depleted in CaO (~7 wt.%) and K2O (<1 wt.%). The diamondiferous TK-4 pipe shows higher bulk MgO (17-2 wt.%) and Mg # (80-83), similar to TK-1 (macrocrystic). MgO in samples from TK-2 and TK-3 is relatively low, ranging from 8.97 to 11.88 wt.%, and is accompanied by a lower Mg# (60 to 72). Lower Mg# may result from water-rock interaction, and the leaching of MgO, as also reflected in the somewhat altered nature of these samples. The TiO2 content of bulk samples of the TKC pipes varies from 2- 4 wt.%, with the exception of TK-1 (macrocrystic) and TK-4, which have the lowest TiO2 (about ~1 wt. %)). Such low TiO2 is also a characteristic feature of the orangeites from the Bastar and Kaapvaal cratons. In plots of major element variation (Fig. 9), TK-1 (macrocrystic) and TK-4 samples are confined to the field of orangeites. Primitive-mantle-normalized trace element abundances for the samples of the TKC show two distinct types of patterns (Fig. 10). Both variants of TK-1 and TK-4 have abundance patterns similar to that of orangeite (Fig. 10), e.g. a positive Pb anomaly and negative Rb, K, Sr and Ti anomalies. 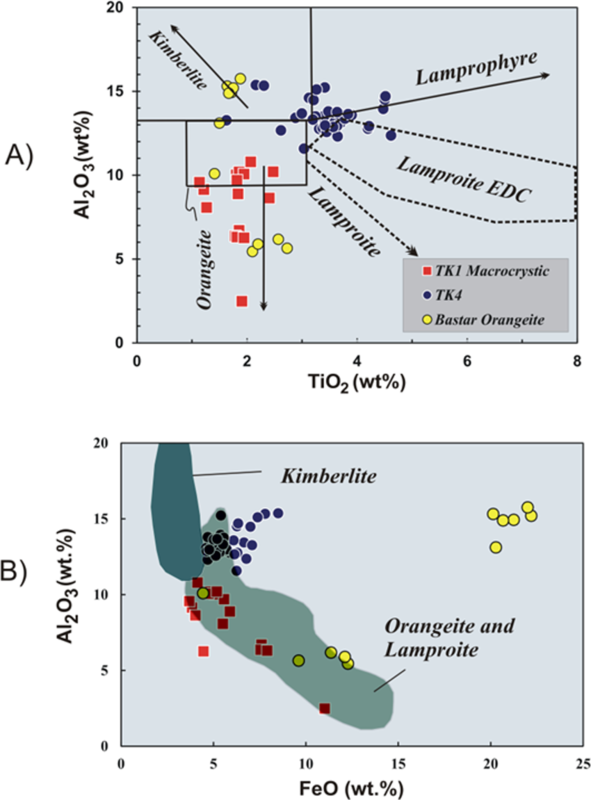 Samples from TK-2 and TK-3 show parallel patterns with pronounced negative Rb, Ba and K anomalies, and somewhat less pronounced negative spikes in the case of Ti, which differs from orangeites (Fig. 10). Positive Pb anomalies are characteristic of Kaapvaal craton orangeites (Becker and Le Roex, 2006) and Bastar orangeites (Chalapathi Rao et al., 2011), but are absent in the samples from TK-2 and TK-3. The lower TiO2, and the higher SiO2 and K2O content of TK-1 (macrocrystic) and TK-4 reflects their orangeitic nature (Smith et al., 1985; Becker and Le Roex, 2006). Bi-variate plots between LIL and HFS elements e.g. La-Rb and Nb-Ba, also highlights the same aspect (Fig. 11). As LILE are known to be more sensitive to secondary alteration, we further tested our argument by using trace element ratios which are generally unchanged during secondary processes and also during magmatic fractionation. Plots of Ba/Nb vs Ce/Pb, La/Yb vs La/Sm and the Pb anomaly vs Lu/Gd shows a marked orangeitic affinity for TK-1 (macrocrystic) and TK-4 (Fig. 11). Furthermore, the the mineral chemistry data also provides support to the orangeite classification of TK-1 (macrocrystic) and TK-4. In situ perovskite dating yields a 206Pb/238U age of 1086±19 Ma for TK-1 (microcrystic) and 1119±12 Ma for TK-3, and a significantly younger Late Cretaceous age of 86.8 ± 3.4 Ma for TK-1 (macrocrystic; Chalapathi Rao et al., 2016). No age could be obtained for TK-4 due to pervasive alteration of the perovskites. The 143Nd/144Nd (i) for the perovskites from TKC kimberlites range from 0.51183 to 0.51231, with εNd values of -8.12 to +7.93 (Chalapathi Rao et al., 2016). The more enriched values of εNd (-5.31 to -8.12) for TK-1 (macrocrystic) further attest to its orangeitic character. It is evident from a binary plot of εNd versus 143Nd/144Nd(i) (Fig. 12) that perovskite from TK-4 yields εNd values of +5.20 to +7.93, which exceeds the accepted upper limit of εNd Group I kimberlites world-wide. We propose that this anomalously high value could be an artifact arising from the assumption of a kimberlite emplacement age of 1100 Ma. Mineralogical and geochemical characteristics imply an orangitic nature for TK-4 similar to that of TK-1 (macrocrystic). Hence, by assuming an emplacement age of say 90 Ma (i.e. that of the TK-1 macrocrystic variant), an enriched εNd values of -10.67 to -12.63 is claculated for T4. Such values fall within the orangeite field, and follow the same mantle-array displayed by the TK-1 (macrocrystic) and the Bastar orangeites. It is further evident from Figure 12 that the data for TK-1 (macrocrystic) and TK-4 (after assigning an emplacement age of 90Ma) are more similar (i.e. comparable) to orangeites, than to lamproites and ‘transitional’ kimberlites. In contrast, the data for TK-1 (microcrystic) and TK-3 are clearly confined to the world-wide data field for archetypal kimberlites (Group 1 kimberlites). Multiple pulses (episodes) of kimberlite magma are clearly present in the TKC. In the case of TK-4, macrocrystic as well as microcrystic phases are observed within a single intrusion (Srinivas Chowdary et al., 2007). In TK-1, two different variants (a microcrystic xenolithic variety, occurring in a macrocrystic host) are observed. These have sufficient mineralogical, major element, trace element, Nd isotope, and age differences, to demonstrate that their derivation from different (separate) batches of kimberlite magma, and discount the possibility of being autoliths. Kimberlites with more than one age population of perovskite, representing xenoliths of an earlier phase of kimberlite intrusion, occur in the Elliott County and Buffonta kimberlite clusters (Heaman and Kjarsgaard, 2000; Heaman et al., 2004). A spatial association of Paleoproterozoic Group I kimberlite and Cretaceous Group II kimberlite has been documented in the Kuruman province on the Kaapvaal craton (Donnelly et al., 2011). Multiple phases of kimberlite magma, with distinct mineral modes, are also reported from the Pipe 2 kimberlite, WKF, India (Dongre et al., 2014), but their age remain unknown. A further, isotopic and geochronological investigation of all the kimberlites of the WKF is required, in view of the presence of multiple emplacement ages of kimberlites on the EDC. 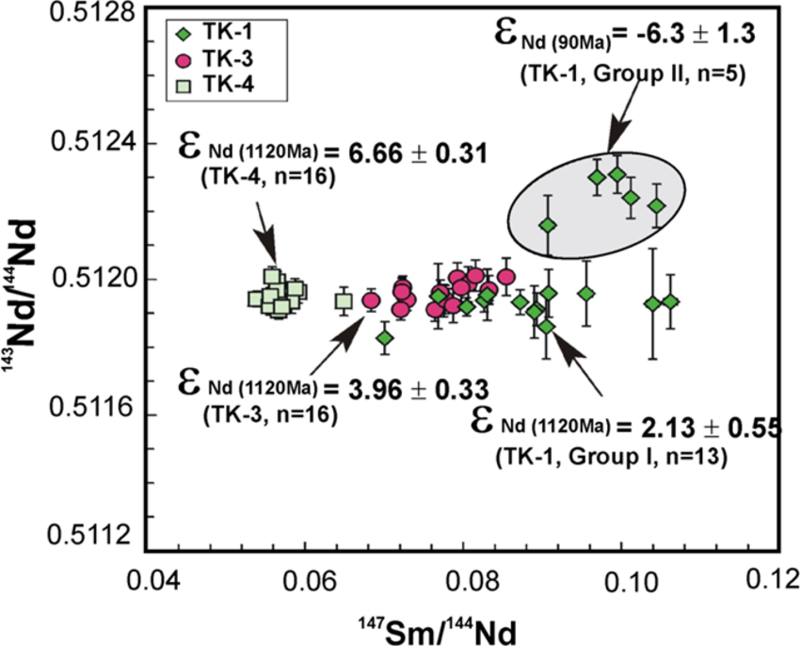 The Nd isotopic compositions of perovskite from TK-1 (microcrystic) and TK-3 have a depleted signature, with TDM Nd model ages of 1.2 - 1.3 Ga, and 1.4 Ga, respectively (Chalapathi Rao et al., 2016). This points to ancient metasomatic enrichment of their source regions during the Mesoproterozoic, similar to that of other EDC kimberlites that have been linked to the break-up of the Columbia supercontinent at 1300 Ma (Chalapathi Rao et al., 2013). The TK-1 (macrocrystic) and TK-4 sources, however, experienced relatively younger source enrichment with TDM Nd model age of ~ 1100 Ma, which is similar to the source-enrichment age of the Bastar orangeites (Chalapathi Rao et al., 2011). This latter source-enrichment age, interestingly, coincides with the widespread emplacement of kimberlites and related rocks into the Eastern Dharwar and Bundelkhand cratons of northern India, at 1100 Ma, which have been interpreted as representing the activity of a short-lived mantle plume during the Mesoproterozoic (Anil Kumar et al., 2007), as well as the timing of the assembly of the Rodinia supercontinent around1000 Ma (Dalziel et al., 2000; Tappe et al., 2014). The enriched signature of TK-1 (macrocrystic) and highly diamondiferous TK-4 (assuming it was emplaced at 90 Ma) necessitates their derivation from a long-lived, thick (> 150 km) lithospheric mantle source. Heat-flow, magnetotelluric and seismic receiver function investigations indicate a much thinner modern day lithosphere thickness (<100 km) for the Eastern Dharwar craton (Pandey and Agrawal, 1999; Gokarn et al., 2004; Kumar et al., 2007). It has been argued that much of the lithospheric root beneath India may have been lost and/or modified during the breakup of Gondwana, and hence the (or during the) rapid northward drift of the Indian plate in the Cretaceous (Negi et al., 1986). However, the presence of diamondiferous orangeites of (i) ca. 65 Ma on the Bastar craton, central India, and (ii) ca. 90 Ma on the Eastern Dharwar craton, southern India, necessitates the survival of thick lithospheric roots up to at least the Late Cretaceous (ca. 90 Ma) in the EDC, and up to 65Ma in the case of the Bastar craton (Lehmann et al., 2010) as the preservation of a rigid (cool) mantle keel extending into the diamond stability field is a requirement for the transport of diamonds to the earth’s surface. If the geophysical perspective of a thinner modern-day Indian lithosphere is correct, then it is likely that interaction of the Indian plate with the Marion (at ca. 90 Ma; Fig. 13) and the Reunion (at ca. 65 Ma) mantle plumes might have played a major role in the destruction of lithospheric roots by eroding the lower portions of the Indian plate, thereby facilitating its rapid northward movement after the Late Cretaceous (Pandey and Agrawal, 1999; Eagles, 2013). Anil Kumar, Heaman, L.A., Manikyamba, C. 2007. Mesoproterozoic kimberlites in south India: a possible link to ~1.1 Ga global magmatism. Precambrian Research 15, 192–204. Becker M., Le Roex, A.P. 2006. 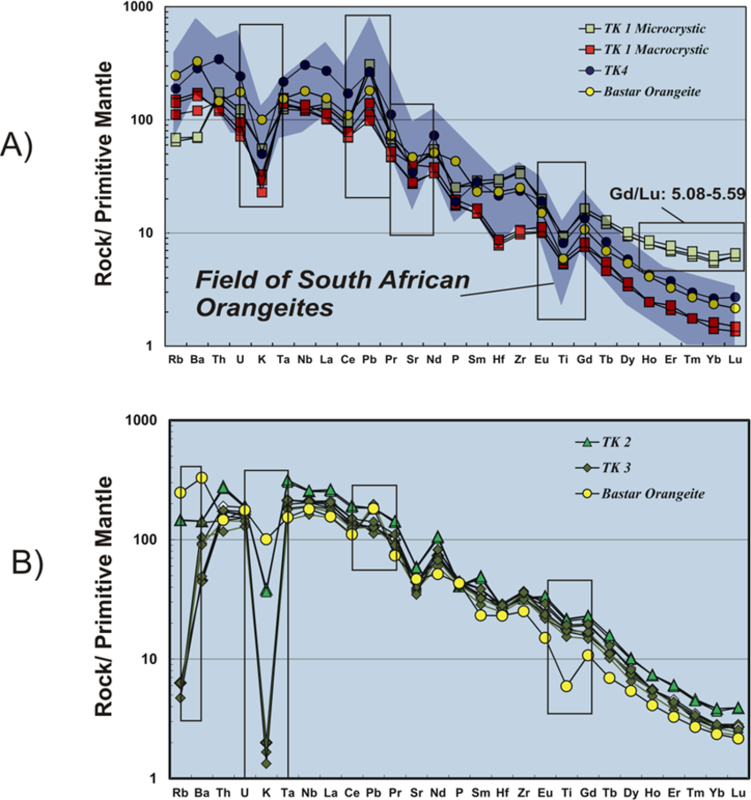 Geochemistry of South African on- and off-craton Group I and II kimberlites: petrogenesis and source region evaluation. Journal of Petrology 47,673–703. Bryan, S.E., Ernst, R.E., 2008. Revised definition of Large Igneous Provinces (LIPs): Earth-Science Reviews 86, 175-202. Campbell, I.H., Griffiths, R.W., 1990. Implications of mantle plume structure for the evolution of flood basalts. Earth Planet. Sci. Lett.99, 79–93. Chalapathi Rao, N.V., Lehmann, B. 2011. Kimberlites, flood basalts and mantle plumes: New insights from the Deccan large igneous province. Earth Science Reviews 107(3), 315-324. Chalapathi Rao, N.V., Lehmann, B., Mainkar, D., Belyatsky, B. 2011. Petrogenesis of the end-Cretaceous diamondiferous Behradih pipe: implication for mantle plume lithosphere interaction in the Bastar craton, central India. Contributions to Mineralogy and Petrology 161, 721–742. Chalapathi Rao, N.V., Wu, F.Y., Mitchell, R.H., Li, L.Q., Lehmann, B. 2013. Mesoproterozoic U–Pb ages, trace element and Sr–Nd isotopic composition of perovskite from kimberlites of the Eastern Dharwar craton, southern India: distinct mantle sources and a widespread 1.1 Ga tectonomagmatic event. Chemical Geology 353, 48–64. Chalapathi Rao, N.V., Dongre, A.N., Wu, F.Y., Lehmann, B. 2017. A Late Cretaceous (ca. 90Ma) kimberlite event in southern India: Implication for sub-continental lithospheric mantle evolution and diamond exploration. Gondwana Research.44, 236-257. Coe, N., Le Roex, A., Gurney, J.J., Pearson, G.D., Nowell, G. 2008. Petrogenesis of Swartruggens and Star Group II kimberlite dyke swarms, South Africa: constraints from whole rock geochemistry. Contributions to Mineralogy and Petrology 156, 627–652. Cucciniello, C., Melluso, L., Jourdan, F., Mahoney, J.J., Meisel, T., Morra, V. 2013. 40Ar-39Ar ages and isotope geochemistry of Cretaceous basalts in northern Madagascar: refining eruption ages, extent of crustal contamination and parental magmas in a flood basalt province. Geological Magazine 150, 1-17. Dalziel, I.W.D., Mosher, S., Gahagan, L.M. 2000. Laurentia–Kalahari collision and the assembly of Rodinia. Journal of Geology 108, 499–513. Dongre, A., Chalapathi Rao, N.V., Malandkar, M. 2014. Petrogenesis of macrocrystic and aphanitic intrusions in Mesoproterozoic diamondiferous pipe 2 kimberlite, Wajrakarur kimberlite field, eastern Dharwar craton, southern India. Geochemical Journal 48 (5), 491-507. Donnelly, C.L., Griffin, W.L., O’Reilly, S.Y., Pearson, N.J., Shee, S.R. 2011. The kimberlites and related rocks of the Kuruman kimberlite Province, Kaapvaal craton, South Africa. Contributions to Mineralogy and Petrology 161, 351–371. Eagles, G. 2013. Ridge push, mantle plumes and the speed of Indian plate. Geophysical Journal International 194(2), 670-677. Ernst, R.E. 2014. Large Igneous Provinces. Cambridge University Press, 653 p.
Ernst, R.E., Jowitt, S.M. 2013. Large Igneous Provinces (LIPs) and metallogeny. Society of Economic Geologists Spec. Publ., 17, 17-51. Gokarn, S.G., Gupta, G., Rao, C.K. 2004. Geoelectric structure of the Dharwar Craton from magnetotelluric studies: archean suture identified along the Chitradurga–Gadag schist belt. Geophysics Journal International 158, 712–758. Heaman, L.M., Kjarsgaard, B.A. 2000. Timing of eastern North American kimberlite magmatism: continental extension of the Great Meteor hotspot track? Earth and Planetary Science Letters 178, 253– 268. Heaman, L.M., Kjarsgaard, B.A., Creaser, R.A. 2004. The temporal evolution of North American kimberlites. Lithos 76, 377–397. Hetman, C.M., 2008. 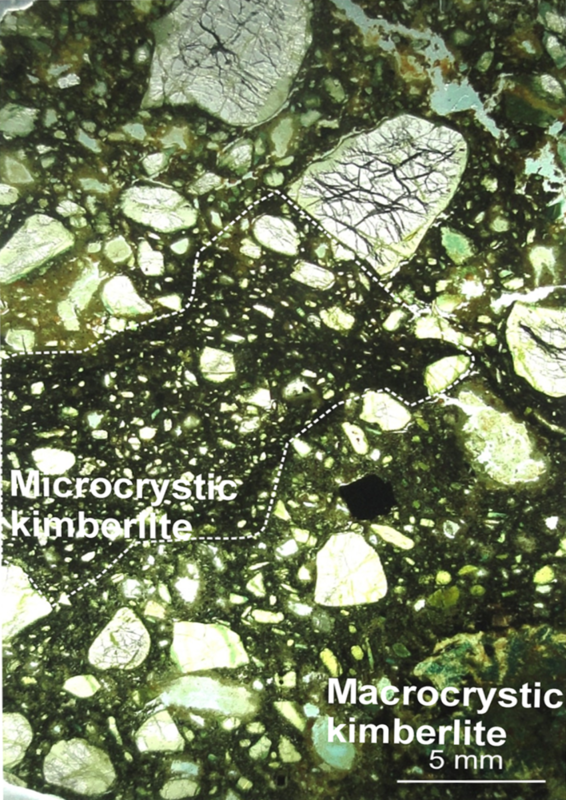 Tuffisitic Kimberlite (TK): A Canadian perspective on a distinctive textural variety of kimberlite. Journal of Volcanology and Geothermal Research 174, 57-67. Lehmann, B., Burgess, R., Frei, D., Belyatsky, B., Mainkar, D. Chalapathi Rao, N.V. Heaman, L.M. 2010. Diamondiferous kimberlites in Central India synchronous with the Deccan flood basalts. Earth and Planetary Science Letters 290, 142–149. Le Roex, A.P., Bell, D.R., Davis, P. 2003. Petrogenesis of Group I kimberlites from Kimberley, South Africa: evidence from bulk rock geochemistry. Journal of Petrology 44, 2261–2286. Mitchell, R.H., 2008. Petrology of hypabyssal kimberlites: relevance to primary magma compositions. Journal of Volcanology and Geothermal Research 174, 1-8. Nayak, S.S., Kudari, S.A.D., 1999. Discovery of diamond-bearing kimberlites in Kalyandurg area, Anantapur district, Andhra Pradesh. Current Science 76, 1077–1079. Negi, J.G., Pandey, O.P., Agrawal, P.K. 1986. Super mobility of hot Indian lithosphere. Tectonophysics 131, 147-156. Pandey, O.P., Agrawal, P.K. 1999. Lithospheric mantle deformation beneath the Indian cratons. Journal of Geology 107, 683-692. Reeves, C., 2014. The position of Madagascar within Gondwana and its movements during Gondwana dispersal. Journal of African Earth Sciences 94, 45-57. Schissel, D., Smail, R. 2001. Deep-mantle plumes and ore deposits. Geol. Soc. America Spec. Publ. Spec. paper 352, 291-322. Smith, C.B., Allsopp, H.L., Kramers, J.D., Hutchinson, G., Roddick, J.C. 1985. Emplacement ages of Jurassic-Cretaceous South African kimberlites by the Rb-Sr method on phlogopite and whole-rock samples. Transactions of the Geological Society of South Africa 88, 249-266. Sridhar, M., Sinha, K.K. 2008. Testing of the diamondiferous nature of the newly discovered kimberlites in the Wajrakarur field, Anantapur district, Andhra Pradesh. Records of the Geological Survey of India 140 (Part-5), 25. Srinivas Chowdary, V., Rau, T.K., Bhaskara Rao, K.S., Sridhar, M., Sinha, K.K. 2007. Timmasamudram kimberlite cluster, Wajrakarur kimberlite field, Anantapur district, Andhra Pradesh. Journal of the Geological Society of India 69, 567–610. Storey, M., Mahoney, J.J., Saunders, A.D., Duncan, R.A., Kelley, S.P., Coffin, M.F., 1995. 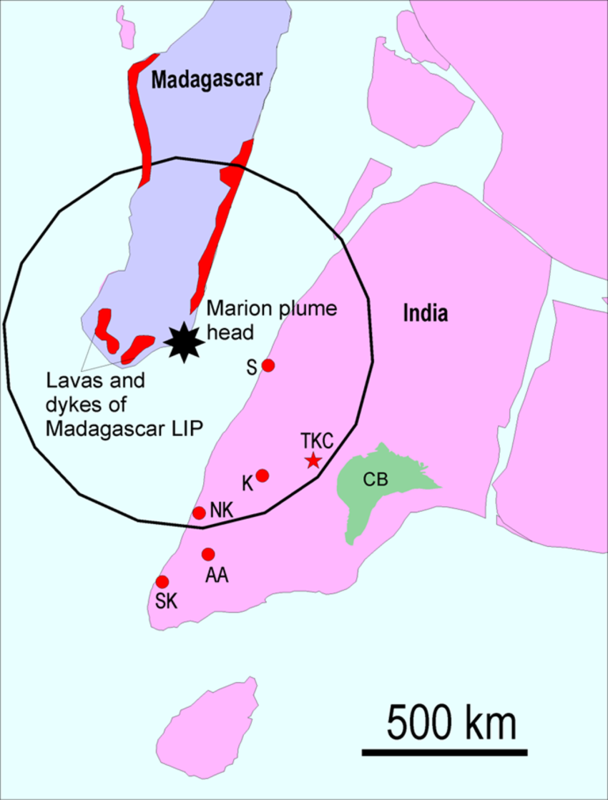 Timing of hotspot related volcanism and the breakup of Madagascar and India.Science 267, 852-855. Storey, M., Mahoney, J.J., Saunders, A.D., 1997. Cretaceous basalts in Madagascar and the transition between plume and continental lithosphere mantle sources. (In: Mahoney, J.J., and Coffin, M.F., ed., Large Igneous Provinces), American Geophysical Union Monograph 100, 95-122. Tappe, S., Kjarsgaard, B.A., Kurszlaukis, S., Nowell, G.M., Philips, D. 2014. Petrology and Nd–Hf isotope geochemistry of the Neoproterozoic Amon kimberlite sills, Baffin Island (Canada): Evidence for deep mantle magmatic activity linked to supercontinent cycles. Journal of Petrology 55, 2003–2042. Torsvik, T.H., Tucker, R.D., Ashwal, L.D., Eide, E.A., Rakotosolofo, N., de Wit, M.J., 1998. Late Cretaceous volcanism in Madagascar: paleomagnetic evidence for a stationary Marion hot spot. Earth and Planetary Science Letters 164, 221-232. Torsvik, T.H., Tucker, R.D., Ashwal, L.D., Carter, L.M., Jamtveit, B., Vidyadharan, K.T., Venkataramana, P. (2000). Late Cretaceous India-Madagascar fit and timing of break-up related magmatism. Terra Nova, v. 12, p. 220-224. Wu, F.Y., Mitchell, R.H., Li, Q.L., Sun, J., Liu, C.Z., Yang, Y.H., 2013. In situ U–Pb age determination and Sr–Nd isotopic analysis of perovskite from the Premier (Cullinan) kimberlite, South Africa. Chemical Geology 353, 83–95. Zhang, D.Y., Zhang, Z.C., Santosh, M., Cheng, Z.G., Huang, H., Kang, J.L., 2013. Perovskite and baddeleyite from kimberlitic intrusions in the Tarim Large Igneous Province: signal of the onset of an end-Carboniferous mantle plume. Earth and Planetary Science Letters 361, 238–248. 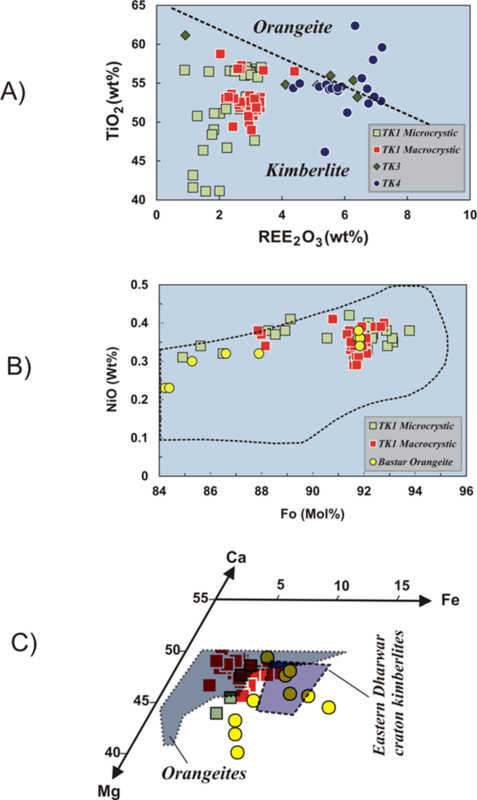 Figure 1: Kimberlites and LIPs in southern Africa after Ernst and Jowitt (2013). Map and ages of kimberlite clusters are after Schissel and Smail (2001), and location of Madagascar plume centre at c. 90 Ma is based on reconstruction of Torsvik et al. (2000). Note that the reconstruction of Reeves (2014) would place Madagascar several hundred km further from the coast at this time. Figure 2: Generalized geological map (after Nayak and Kudari, 1999) of the Wajrakarur kimberlite field in eastern Dharwar craton, southern India, showing the location of Timmasamudram kimberlite cluster (reproduced from Chalapathi Rao et al. 2016). with a coarser grained macrocrystic kimberlite in the TK-1 pipe (reproduced from Chalapathi Rao et al. 2016). 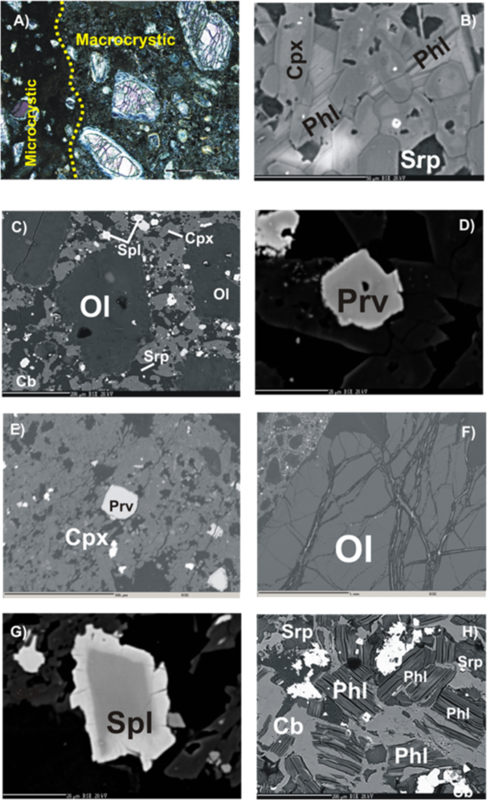 Figure 4: A) Photomicrograph of TK-1 kimberlite in transmitted light showing a finer grained microcrystic variant having dark colored groundmass (boundary demarcated by dotted line) and coarser grained macrocrystic variant, B) BSE image of TK-1 (macrocrystic) showing association of phlogopite (phl), clinopyroxene (cpx) and serpentine (srp) in the groundmass, C) Inequigranular texture of TK-1 (macrocrystic) showing large olivine (ol) in the groundmass rich in spinel (spl), perovskite (prv), carbonate (cb), clinopyroxene and serpentine, D) Unaltered perovskite in TK-1 (macrocrystic), E) Clinopyroxene and perovskite association in the groundmass of TK-1 (macrocrystic) kimberlite; F) Large olivine macrocryst in TK-1 kimberlite; G) Zonned spinel in TK-1 (microcrystic) showing dark color Cr rich core and irregular boundaries and F) Groundmass texture of TK-4 (macrocrystic) kimberlite exceptionally rich in phlogopite, carbonate and serpentine. (reproduced from Dongre et al. 2017). (C) and TK-4 (D) kimberlites of this study. The first age is intercept age (as shown by arrow), and the others are the average 206Pb/238U ages using 204Pb and 207Pb corrections, respectively. (reproduced from Chalapathi Rao et al. 2016). Figure 6: 147Sm/144Nd vs 143Nd /144Nd for perovskites of this study (reproduced from Chalapathi Rao et al. 2016). Figure 8: A) TiO2 versus ∑REE2O3( La2O3, Ce2O3 and Nd2O3) variation for perovskites, B) NiO versus Fo (mol.%) variation for fresh olivines from TK1 pipe, C) Atomic Mg-Fe-Ca variation for clinopyroxenes from TK-1 kimberlite (reproduced from Dongre et al 2017 where all related references can be found). 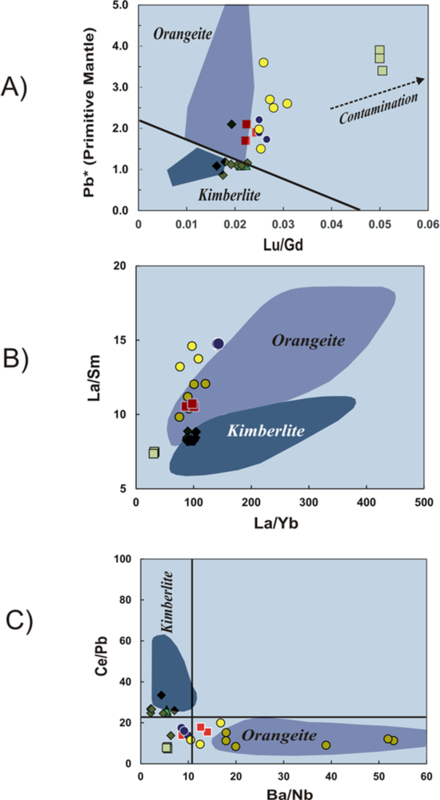 Figure 9: MgO versus SiO2 (A) and SiO2 versus K2O variation for kimberlites under study (reproduced from Dongre et al 2017 where all related references can be found). 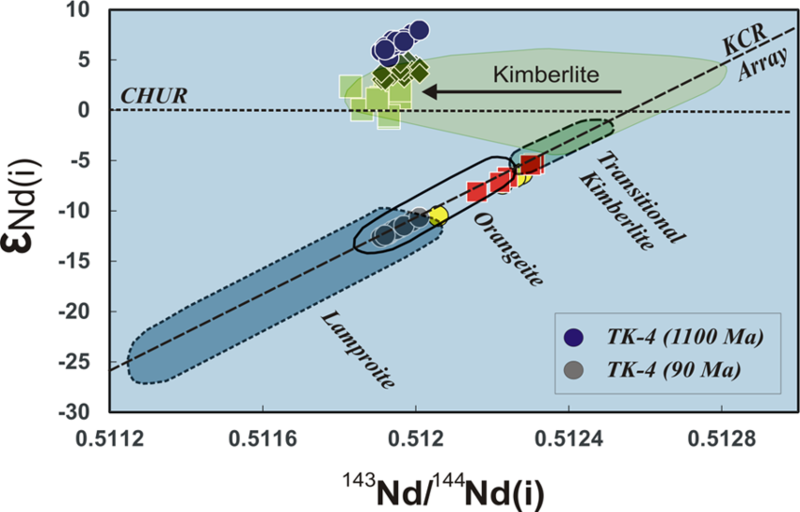 Figure 10: Primitive mantle normalized multi element plot for TK-1 and TK-4 kimberlites (A) and TK-2 and TK-3 kimberlites (reproduced from Dongre et al 2017 where all related references can be found). Figure 12: εNd vs 143Nd vs 144Nd(i) plot for kimberlites under study (reproduced from Dongre et al 2017 where all references can be found). Gray circles represent TK-4 kimberlite (after considering 90 Ma). Symbols for other kimberlites remain the same as in previous figures. KCR: kimberlite clan rocks. Figure 13: A paleogeographic reconstruction map (after Reeves, 2014) showing the India- Madagascar reconstruction at 88 Ma, the position of the Marion plume, and the location of various igneous rocks of that age). CB = Cuddapah basin; SK = south Kerala dykes; NK = north Kerala dykes; AA=Agali-Anaikatti dykes; S=St.Marys island volcanics; and K=Kunigal dykes. Radius of the circle of influence of the Marion plume is 1100 km (reproduced from Chalapathi Rao et al. 2016).